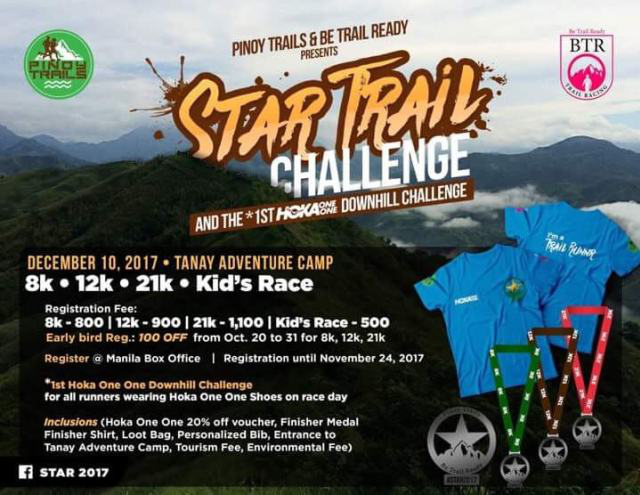 Pinoy Trails and Be Trail Ready brings you STAR Trail Challenge 2017 on December 10, 2017 at Tanay Adventure Camp. Formerly known as Sierra Trail Adventure Race (STAR), the 2017 edition brings the STAR in you as you navigate the rolling trails of Sampaloc, Tanay, Rizal starting at Tanay Adventure Camp while your eyes get feasted on the scenic Sierra Madre Mountain Range. There’s a STAR in all of you from the newbies, experienced, elites and even the kids with the different distances and categories. It’s time to be a STAR in December as you enjoy the jovial mood and the cooler climate of Tanay with a full range of dirt surfaces to explore.